This is my first time at MIPIM, showcasing Derbyshire on an international platform and I have to admit I was a little apprehensive about what to expect. No one can really prepare you for the unbelievable scale of the vast global property summit, the number of suits and the unrelenting schedule, but the location and the weather demand positivity and Team Derby and Derbyshire are here to do business. Invest in Derbyshire have a packed schedule of meetings, cultivating some existing relationships and creating new ones, with developers, professional service companies and hotel operators. The reaction to the offer of Derbyshire is overwhelmingly positive and we are looking forward to following up on these leads when we get back to the UK. Alongside the meetings, we have a busy schedule of events and today Frank Horsley, Head of Economic Regeneration at Derbyshire County Council presented Derbyshire to a packed Marketing Derby Embassy. As well as introducing the new Invest in Derbyshire brand and website, Frank told delegates that Derbyshire is a truly unique place for investors, a place that stands out from the crowd due to its outstanding sectoral strengths, well connected sites and unrivalled quality of life. Tomorrow is a new day and we are already anticipating the new opportunities it will bring for our County. Marketing Derby’s Embassy at MIPIM – the international real estate fair in Cannes - was held this morning in front of a packed audience of investors and delegates eager to hear about Derby and Derbyshire’s development plans. Marketing Derby premiered its new film ‘Capital for Innovation’, which was produced by Purpose Media, providing an insight into what makes the city tick and how its skyline is changing. At the Embassy John Forkin, Managing Director of Marketing Derby announced that Bondholder Godwin Development’s Landmark scheme was not being called in by the Secretary of State and would therefore be going ahead, bringing 202 high-quality Build to Rent apartments into north Riverside. Elizabeth Fagan, Chair of Bondholder D2N2 Local Enterprise Partnership outlined the commitment of D2N2 to supporting inward investment into Derby and Derbyshire and gave the MIPIM audience an overview of the LEP’s ambitious plans to accelerate growth across the area. Support from the LEP has enabled Derby and Derbyshire to be part of the Midlands UK Pavilion, which is an important component of the team’s schedule for the week. As part of a 100-strong delegation from across the Midlands, Derby and Derbyshire’s opportunities form part of a portfolio of £11 billion of investment-ready projects. Its plan is to deliver a £554m investment package; accelerating growth in Derby, Derbyshire, Nottingham and Nottinghamshire. Its Strategic Economic Plan details how D2N2 will support innovation, research, housing investment, the rural economy and promotion of high business activity sites. Bondholder University of Derby revealed exciting plans to move forward on both its city campus and Science Park. Professor Judith Lamie, Pro Vice-Chancellor of External Affairs for University of Derby gave delegates an update on the University’s plans to further extend its estate into the city centre to include a new University Enterprise Zone, as well as develop a Science Park at Infinity Park Derby. Delegates heard how the University has recently risen up the league tables and is ranked in the top 20 UK universities and the top 100 in Europe for teaching excellence. The University contributes £659m to the local economy. Having opened its Law School at One Friar Gate Square in the city’s cathedral Quarter in 2016, the University is now considering the possibility of its Business School joining it on the west side of the city centre. The proposed Science Park at Infinity Park Derby will create an environment which embodies the spirit of innovation through collaboration. It will bring together global companies and small and medium-sized enterprises with leading-edge academic researchers, policy-makers and funders. 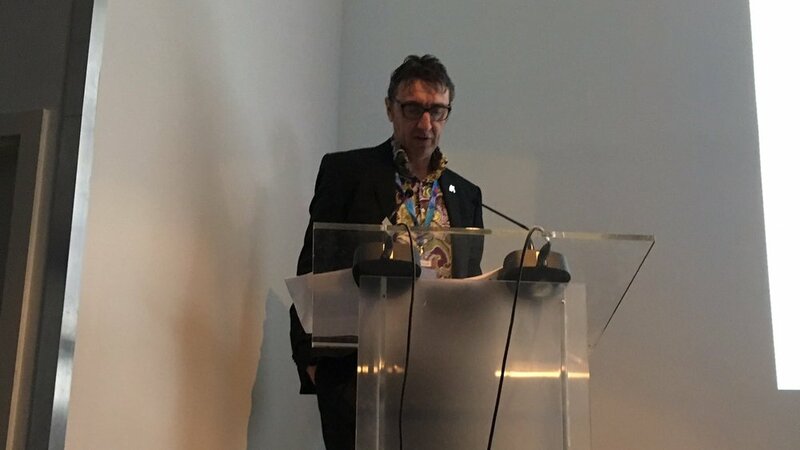 Delegates heard from Frank Horsley, Head of Economic Regeneration for Derbyshire County Council, who outlined the Derbyshire offer to investors and developers at MIPIM, highlighting the excellent connectivity at the heart of the UK, alongside opportunities for capital investment at key sites. The economic strengths of the county were highlighted to a packed audience showcasing the globally recognised and committed manufacturing businesses as well as a reputation for modern engineering excellence. Global grands such as Toyota, John Smedley, Thorntons, Buxton Water as well as strong and well-established supply chains underpin this reputation. A sense of the ambition of the county was given through key schemes spanning the breadth of Derbyshire, including premier industrial/ distribution developments at Markham Vale, at J29A of the M1, and Bondholder CWC’s Dove Valley Park at the centre of one of the country’s most important manufacturing areas in South Derbyshire. Redevelopment and restoration of Grade-1 listed Buxton Crescent will put the spa town back on the international map with plans to include a 5* hotel to return one of England’s finest Georgian buildings to its glory. The quality of life available in Derbyshire is second to none and forms a key part of the decision-making of businesses choosing to locate in the area. Frank Horsley said “I strongly believe that we have an offer that is truly unique for investors which helps Derby and Derbyshire stand out from the crowd. Bondholder Derby City Council reiterated its ambition to move the city forward by giving further details on a number of key schemes. Audiences at the Marketing Derby Embassy and Midlands UK Pavilion spotlight on Derby heard how Derby is shaping its future as a hi-tech city and cementing its position as the UK Capital for Innovation, as the City Council takes a proactive approach to stimulating markets across the city. Cllr. Matthew Holmes, Deputy Leader of Derby City Council talked about the city’s approach to catalysing growth at Infinity Park Derby with recent investments by the City Council of £19.3m, including a high-quality technology space which aerospace company and Bondholder Pattonair is poised to lease, as its global HQ, upon completion. This comes in addition to the Nuclear Advanced Manufacturing Research Centre’s expansion into Derby which has been launched recently at its current home in the iHub, part of the City Council’s highly successful Connect scheme of managed workspaces. The NAMRC is part of the UK’s High-Value Manufacturing Catapult aimed at bridging the gap between academia and industry with a focus of the Derby centre being controls instrumentation especially in nuclear applications. Catherine Williams, Head of Regeneration and Major Projects for Derby City Council gave delegates an update on City Centre Masterplan schemes including progress with the proposed sale of the Debenhams building to St James’ Securities, the vision for the wider Becket Well area, new office and leisure investments as well as the renovation work on the Market Hall. Catherine said: “We have reports going to the cabinet this evening which will extend the exclusivity period with St James’ Securities and we look forward to the imminent submission of planning permission for the site. Marketing Derby beat competition from New York and Hong Kong - which came 2nd and 3rd respectively - to win Best Investment Promotion Agency Web Strategy in the Financial Times fDi intelligence Strategy Awards 2018. The Agency was also commended for ‘Growth Capital’ in recognition for the support it provides to companies wishing to invest and grow in the city. fDi Intelligence is a service from the Financial Times and is the largest Foreign Direct Investment centre of excellence globally. When writing about Marketing Derby in its awards release it said: “Marketing Derby employs the latest technology to attract investors to the city and provide intelligent information on its investment sites and offerings, from a virtual reality map giving the user a complete view of the city’s key development sites and a tour of Derby, to a GIS-enabled web platform providing data, analytics and property information for potential investors. 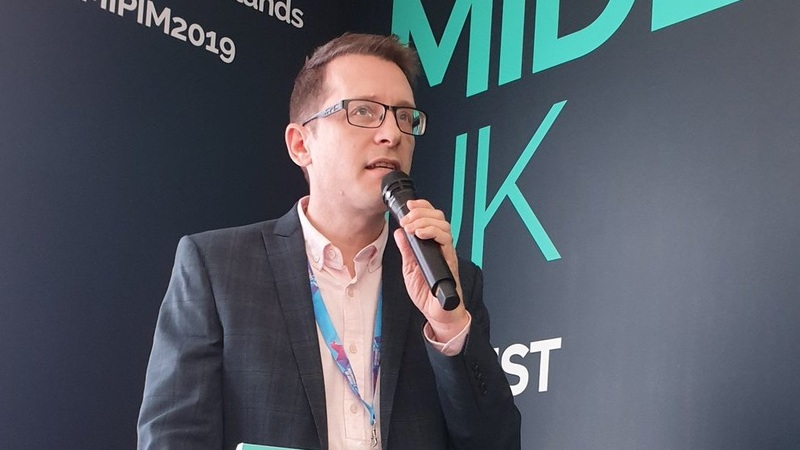 Receiving the award at MIPIM 2019, Bob Betts, Chair of Marketing Derby, said: "We work very hard to ensure that our digital platforms are innovative, engaging and informative for our investors including campaigns in markets such as China. 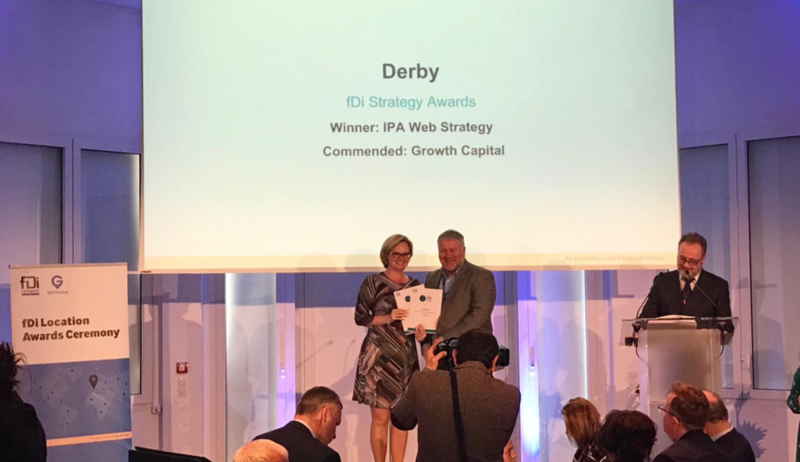 To be recognised by fDi Intelligence as being amongst the world’s best is a stunning endorsement for the whole team, both here at Marketing Derby and with our partners, which we really welcome." MIPIM is incredibly, intimidatingly, mind-blowingly vast. Over the next three days, more than 26,000 delegates from 100 countries will pack its exhibitions and seminars. They will listen to 360 speakers - including Secretary General of the UN Ban Ki-moon. Among them will be fund managers and real estate investors responsible for more than £3 trillion of wealth. Nearly every major nation, region and city will be represented. And underneath the bright blue skies of the Cote D’Azur, Team Derby and Derbyshire will compete with them all to grab a share of the investment pound, euro, dollar or ruble. How? Well, Derby will do what it does best. It will graft. While some cities can wait for the world to come to them, Derby’s delegates will wear down shoe leather treading the corridors of the Palais Des Festivals in Cannes hunting down opportunity. They are well prepared. Dozens of meetings were arranged before the team jetted out from Birmingham Airport. More than 150 attendees had signed up for the Derby Embassy event which was held this morning at the Eden Hotel, where the city made its main pitch. There are strong investment opportunities to be had - particularly in connection with the University of Derby’s proposed city centre campus and the science park at Infinity Park. MIPIM has already started well, with Marketing Derby collecting a major award from the Financial Times for digital innovation. The accolade put it alongside major world cities such as London, Berlin, Moscow and Kiev - the latter represented by former world heavyweight boxing champion Wladimir Klitschko. As MIPIM rolls on, Team Derby and Derbyshire will continue to punch above its weight on the international stage! It’s that time of year again (already) and Team Derby has arrived at MIPIM - very high winds made for a turbulent arrival into Nice, but we made it! I’ve spent the best part of the year to date preparing for this week - planning the logistics, events and booking a busy schedule of 1-2-1 meetings for all our team members. As we head into a week of presentations and pitches, our narrative is honed so that Derby stands out amongst the hundreds of other locations competing for investor attention this week. Derbyshire is well known as the birthplace of the industrial revolution, and Derby has long been heralded as the UK Capital for Innovation. We are home to global giants such as Rolls-Royce, Toyota Manufacturing UK and Bombardier. Recent announcements including the opening of the Nuclear AMRC and a new research and innovation centre at Infinity Park Derby also feed into the narrative. Home-grown SMEs pioneering new technology are ensuring Derby stays at the forefront of global industry across a whole host of different sectors. Our key headline sponsor The University of Derby has recently enjoyed a meteoric rise through the league tables and is rated TEF gold standard for teaching excellence. Currently plans are being considered to expand its reach beyond the Kedleston Road campus further into the city centre and to a purpose built Science Park on Infinity Park Derby. So why is all this interesting to the investors and developers we’re looking to court at MIPIM this year? Derby is a place people come to, to work and live. All the above means the city has the highest average salaries in England outside of London and the South East, and this, coupled with the relatively low cost of living gives Derbeians the highest disposable income in the UK. Derby regularly features highly on league tables charting GVA, economic growth and the best place to live and work, but for years no new offices or housing have been built in the city centre. Regeneration is finally underway, as investors and developers start to understand the opportunity in Derby. MIPIM offers us the chance to showcase our city on a global stage and we will use the week to show the world why Derby should be on their radar. We're on our way to MIPIM! As you read this I’ll be sitting on a bus, a plane or, maybe even a train, as a member of the largest team that we have ever sent to MIPIM representing Derby and Derbyshire. MIPIM is the annual global real estate and investment exhibition - attended by 25,000 delegates – held in Cannes on the French Cote D’Azur. We are exhibiting as part of the Midlands UK - which has its own Pavilion, thanks to D2N2 for funding this aspect - and our midlands team is now so large that the region has chartered its own plane to take us there, saving us a fortune. Our team includes representative from the city and county councils, businesses and of course Marketing Derby. Key sponsors are University of Derby and Smith Partnership, as well as supporting sponsors Idom Merebrook, Innes England, Faithful and Gould, Knights, Justin Smith Architects, Godwin Developments and East Midlands Airport. I know it’s in Cannes and I know it will be sunny but believe me, we have a packed schedule lined up for the week ahead which will keep us incredibly busy and, as a gentle wave of exhaustion begins to subsume the anticipation and excitement of today, only adrenalin will keep us going till Friday. No doubt the meetings will start in the airport lounge in Birmingham today and go on to the airport lounge in Nice on Friday. So, what’s the point of it all you might ask? The answer is simple – MIPIM gives us profile on an international platform, plus the opportunity to create and cultivate investor relationships. Basically, we get to cram in months of meetings in one week, as well as present at seminars and hold one of our Embassies. MIPIM is invaluable in supporting our strategy to develop relationships with investors who are keen as we are to see the city and county move forward. Keep an eye out for our daily blogs, many tweets, MDTV clips and a MIPIM e-shot special on Wednesday. As key headline sponsor for Team Derby and Derbyshire at MIPIM 2019, Bondholder the University of Derby will use the event to showcase its future plans for investment and development. Professor Judith Lamie, Pro Vice-Chancellor - External Affairs at the University and Marketing Derby Board Member, will lead the University’s team along with Professor Warren Manning, Pro Vice-Chancellor Dean of the College of Engineering and Technology. Commenting about their attendance at the world’s largest property event, Professor Lamie said: "For the University of Derby there are two main reasons to attend MIPIM this year - the current investment opportunities with regards to our ambitions to extend our campus further into the city centre, and the proposed Science Park at Infinity Park Derby, and secondly, supporting the ongoing regeneration of the city in order to attract more students." The University of Derby’s plans include the development of a University Quarter in the city including a new University Enterprise Zone as well as a possible new business school. The University staff will join the largest Derby and Derbyshire team at MIPIM and will take part in the first international Derby and Derbyshire Embassy on Wednesday 13th March.